like get apple 1000 to get 1000 apples. Not yet. Most of what you see is really the base functionality available at this date. Is this project (and VT) dead? MK's Patreon only talks about animations and never mentions the games at all. AnonymousRandomAnon wrote: Is this project (and VT) dead? MK's Patreon only talks about animations and never mentions the games at all. Of course not! I'm in the process of updating the Patreon page this month BTW, so hopefully I'll improve on that aspect. The project is just being slow that's all... lots of things to work on at a time, and I'm rather demotivated by many patrons having pulled out and left us with barely enough money to survive. Both this and Vore Tournament will see new progress over time. It's a vicious cycle, don't give up and don't lose too much confidence. If people see that you're panicking, they might not be so willing to believe you are going to continue, and wont donate. EDIT: also be careful to avoid making 50 different projects at once. STRESS++, for reals, yo. Milk was implemented as a second food type. A new sales person has been added with it, which will also appear randomly and sell you milk when you're in need. Milk costs roughly half as much as apples, but is also only half as filling for your pet. 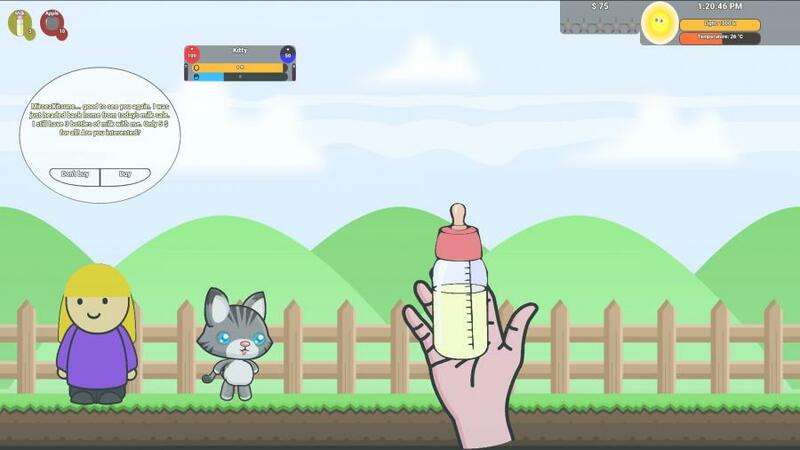 Milk is also the food you start the game with, apples now being the first unlockable food which only becomes available after your pet has aged a little. Constants have been implemented in the engine. You can now define common values to act as settings in mods, which are read-only and will not be saved in the browser cookie. This solves a major annoyance affecting any large game that may be created with this engine, where if you wanted to change a base setting you had to scan thousands of lines of json to remember every place in which you're using it. Layer inheritance has been improved and is now used by default. Any layer in any sprite may now inherit the properties of any other layer from any other sprite, using its properties unless the sprite then overrides any specific one. This helps further reduce and cleanup sprite definitions, once more making it easier to do common changes without having to edit each definition individually. Support for browser tooltips has been implemented. Hovering over certain UI elements will tell you what they mean, useful for new players. Sounds can now be random as well, by defining the sound source as an array of strings rather than a single string.